“Bricks + Clicks: The How‐Tos of eLearning” is an online six‐week pedagogy course designed for Otis College faculty and instructors who wish to learn/ consider/ integrate/ reflect upon both pedagogy and best practices of teaching tech‐enhanced, blended (hybrid), or fully online courses. The pedagogies and technologies presented and discussed in this course are not discipline-specific and can be applied in regular face-to-face instruction. A digital badge is earned for successful completion of Bricks + Clicks and shows that faculty and instructors are prepared to teach eLearning courses (blended or fully online) at Otis College of Art and Design. We encourage Bricks + Clicks alumni to post their digital badges on LinkedIn to showcase their new skills. have completed Bricks + Clicks. 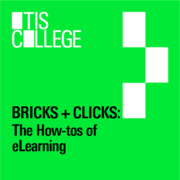 Bricks + Clicks is offered every semester at Otis College. Applications are due by the 3rd Friday of every semester. A grant will be awarded after successful completion of the Bricks + Clicks course. Bricks + Clicks alumni come from all across Southern California. These faculty/instructors are prepared to develop and teach eLearning Courses at Otis College offering flexibility when it comes to commuting to campus. Explore the B+C alumni map.